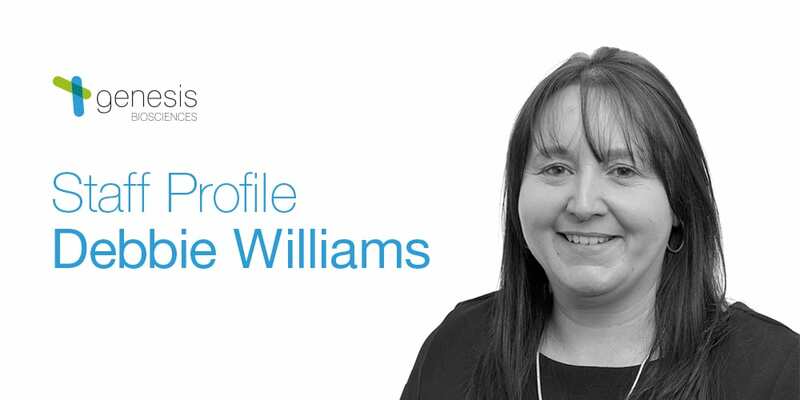 As the Group Compliance Officer at Genesis Biosciences, Debbie Williams deals with regulatory compliance for both our UK and US facilities. She also in charge of overseeing our R&D projects and the day-to-day running of our lab – a true operational commander-in-chief. In her role as Group Compliance Officer, Debbe is responsible for keeping Genesis Biosciences above board and iron clad in what we say and do, from achieving our ISO certifications to ensuring our products meet our high quality control and quality assurance standards. Our products are also developed under her watchful eye, as she plans and manages our research and development. Debbie oversees the lab where the making of a new product happens – no wonder she’s a previous ‘Employee of the Quarter’ and ‘Employee of the Year’ winner! That’s why Debbie is vital in keeping the Genesis Biosciences ship sailing smoothly. But what’s it like, managing such a high-scale operation in the biosciences industry? We thought we’d ask her to shed more light on the matter. Some people probably wouldn’t know what your role as Group Compliance Officer involves – how would you explain it? My day-to-day role involves working closely with our manufacturing partners to ensure that our products are manufactured according to our Quality Control specifications. However, as my background is actually technical/scientific, I am heavily involved in the technical and product development function at Genesis. 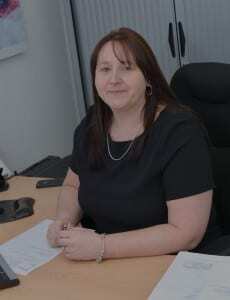 For the UK business, I take care of the day-to-day management of the UK laboratory. I also ensure that the requirements of the Quality and Environmental certifications are adhered to, both in the UK and the US facilities. I do this by working with the team in the US and managing our compliance task force there. You have been at Genesis Biosciences for quite some time – what is it that makes you stay? I am proud to be one of the people who have been with Genesis from day one. I have had a belief in the company and its vision since I first met Conrad, as his enthusiasm for the business has always been strong and is extremely contagious. Initially, I was a Product Development Scientist working mainly in the area of disruptive anti-microbial and vapor phase technologies. Since then, my role has evolved into the wide ranging function I perform for the company today. Experiencing that evolution has been challenging but also exciting. Why are ISO 9001 and 14001 accreditations so important to Genesis Biosciences? Our company vision is to be ‘The market leader in creating and delivering innovative, environmentally-responsible, scientifically validated and verified, performance-driven, eco-benign® technologies and microbial and antimicrobial products and solutions’. The requirements of the ISO standards go hand in hand with this philosophy and it naturally becomes the way we run our business on a daily basis! Genesis’ environmental objectives are clearly important to you and to us, as a company. What’s a typical misconception the general public might have about environmental policy? ‘Environmental’ and ‘green’ terminology have been used loosely over the years. Many years ago, green cleaning products were marketed to be the next best thing but more often than not, the performance was poor at best and the focus was on the benefits to the environment as opposed to product performance. This has given us an interesting challenge in changing opinions, but as we pride ourselves in scientifically validating our product performance claims, we can actually demonstrate that our current product range not only does no harm to the environment but also performs in use! Our environmental credentials are extremely important to us as a company; not only the policy itself, but our whole philosophy of eco-benign® technology drives our product development from first principles. One of the most significant landmarks for me personally was being part of the team that developed the Biosan technology and gaining subsequent approval of the product patent. 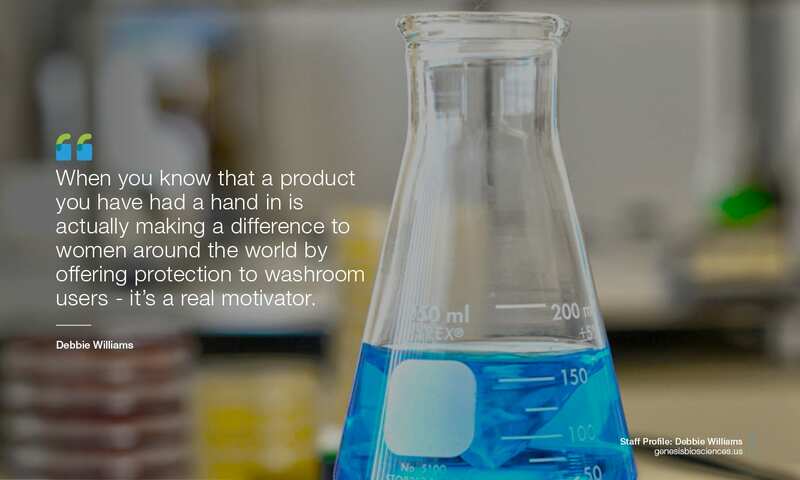 When you know that a product you have had a hand in is actually making a difference to women around the world by offering protection to washroom users – it’s a real motivator. I am fortunate to work within such a talented and dedicated team both sides of the Atlantic. Everyone is driven by the same company goals and it is motivating to see the company achieve these goals. Genesis as a company is constantly evolving and being part of its success drives me to continue to do what I can to support the ongoing success. What does your typical day as Group Compliance Officer include? They say variety is the spice of life and that is certainly the essence of my day. There isn’t a ‘typical’ day for a Group Compliance Officer as such, which is one of the reasons I love coming to work! 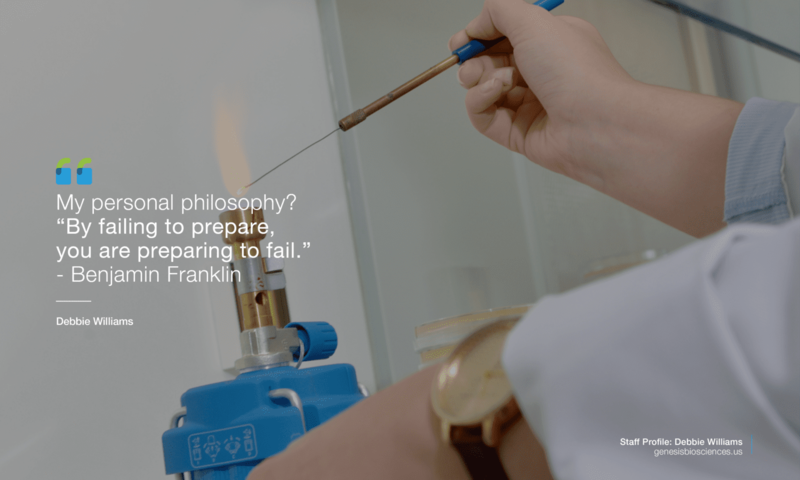 As I support multiple company functions (technical, commercial and operations) my days can include providing technical support to our customer base, liaising with our manufacturing partners to ensure product manufacture is running smoothly, supporting our sales team with incoming enquiries and on occasion, I still get to put on my lab coat and keep my technical skills alive by running experiments. If you had to name one general challenge of quality assurance and compliance regulations, what would it be? I am very lucky in that many Quality Assurance professionals are isolated from the day to day running of a business, whereas I am fortunate enough to be central to many functions and with my background in product development I can draw on the experiences I gained in order to ensure that the quality and environmental management systems support the business and drive continual improvement as opposed to becoming a box ticking exercise. The main challenge for me personally is juggling the compliance requirements with the other parts of my job, but I love a challenge! What is one thing the general public might not know about your job as Group Compliance Officer? The term ‘bacteria’ has historical negative connotations associated with it, which we would like to reverse. A common misconception when talking about bacteria is that they are potentially harmful or undesirable. That is not the case at all; by selecting specialized Bacillus strains which are completely harmless to human health, we produce verified and validated biological products that outperform traditional chemical products. The challenge for us is changing the public’s perception of bacteria! Genesis is unique in that we produce both anti-microbial and microbial products. To be unique in this way and to remain that way is quite a remarkable achievement! What’s next for you as Group Compliance Officer at Genesis? There is always something new and exciting in the plans and I am so excited about the new projects we currently have sitting in the wings; I know Genesis has a bright future ahead and I am looking forward to being part of it!